At year’s end the inevitable list making begins, focused on selecting the standout books, music, films, performances, and other superior artworks of the past twelve months. The attention of the critical compilers invariably gravitates to the high-profile candidates, those that have already garnered the most media and consumer attention. But in the rush to reach a consensus on the “best,” so many modest, low-profile, yet worthy offerings are often overlooked. Here, then, are a mere five books from the vast flood of fine fantastika from 2012: five books not inevitably fated to end up on any best-of list and that might have passed below your radar this year — but all demanding a careful second look. In my column from last year on this same theme of under-praised books, I selected John C. Wright’s Count to a Trillion, released late in the publishing year. The subsequent twelve months saw the book retain its wallflower status, and now Tor debuts the sequel in the same understated manner. So, here we are again! The Hermetic Millennia continues the exotic saga of Menelaus “Meany” Montrose, a rugged and cantankerous individualist of the twenty-third century, born to a high cosmic destiny while also unrepentantly seeking glory. This is a fellow who willingly takes on the title and duties of the “Judge of Ages” after all. But if the reader thought that Montrose’s previous adventures were spectacular, emulating as they did the primal and robust space opera outings of E. E. Smith and A. E. van Vogt, then his newest exploits will amaze the heck out of anyone. What Wright has put forth this time is a mix of British big thinker Olaf Stapledon (Last and First Men), Jack Vance (The Dying Earth), Philip José Farmer (Dark Is the Sun) and Jared Diamond (Collapse: How Societies Choose to Fail or Succeed). It’s a heady brew that achieves an ever-oscillating balance between pulp action and philosophical gravitas. Montrose has gone into suspended animation until the day when he can awaken to deal with an invasion fleet, 8,000 years into his future. But all his careful plans are upset when his secure techno-Tomb is raided in the year 10515 by the Blue Men and their Dog Men helpers, and he discovers a world lapsed into an unforeseen crazy quilt of posthuman barbarism. Now all his intuition, initiative, and intellect must be employed to put affairs back on track. Wright layers on a thick impasto of eons, rich with vivid details of vanished races and ideologies that have come and gone in Darwinian waves. The novel has a Chaucerian feel, as various revenants take the stage to tell their strange tales. The leisurely plot moves forwards satisfactorily, although, this being only an installment in a series, we are left with a melancholy cliffhanger ending. Montrose and his peers — the Hermetics who lend their name to the era — stand as demigods with feet of clay to the average citizen, much in the manner of the immortals in Roger Zelazny’s Lord of Light. “I took the liberty to manipulate history to increase the longevity of certain stories I liked, and I established statistical incentives, introduced self-replicating sociometric viruses, and everything.” But Wright shows that even posthuman brilliance cannot fully contend with the confounding intractability of sentient beings — the human stain, he suggests, doesn’t fade with time. Gregory Benford and Larry Niven are two of the biggest names in the demanding discipline of Hard Science Fiction, with an astonishing total of ninety-five years of professionalism between them. Could their first co-authored novel truly be an overlooked item? In a marketplace where fantasy now predominates, such a book is automatically running with a handicap. And Benford hasn’t had a new novel out since 2005, while Niven — who has stayed busy with other collaborators, to somewhat secondary effect — has not had a solo venture since 2004. For the youngest generation of readers, both men might very well be susceptible to invisibility. The first thing to mention when dealing with two such well-established authors yoked together is to affirm that their contributions blend well, into a seamless hybrid. Readers familiar with the simpatico work of each man will instantly detect grace notes from both. From Niven comes a knockabout, can-do pragmatism; from Benford comes a more philosophical, poetic bent. So the voice for Bowl of Heaven — first in a series, by the way — is a blended newness, a synthesis that at times reminds one of vintage Poul Anderson. We start a couple of centuries hence with utmost verisimilitude, as one might anticipate. A slower-than-light starship is about to be launched from a much-changed Earth (re-wilded, with only two billion humans), aimed for a likely exoplanet. Its crew will sleep the trip away, arriving long after everyone they left behind on Earth is dead. We are introduced neatly to a large cast, with an emphasis on one bonded couple, Cliff Kammash and Beth Marble. Cut quickly to a point some forty years onward. Cliff is brought out of suspension way early: the SunSeeker has encountered a titanic artifact, a manufactured hemisphere surrounding a sun and using that orb for propulsion purposes. Some of the inside of the bowl is living surface, an artificial ecosystem(s) equivalent in area to million of Earths. Cupworld, the humans dub it. Eager to learn more and needing new supplies for unforeseen reasons, they land an expedition, including Cliff and Beth. Then the resident aliens take a hand…. The authors juggle their tripartite narratives nicely, toggling back and forth mainly between the two human parties on Bowl, with an intermittent look at the worried folks back on SunSeeker. There’s plenty of Ringworld-style engineering to jaw-dropping effect, and lot of “humans as clever but hunted animals in the face of inscrutable alien prejudice.” All in all, the book delivers in spades a cheerfully sublime, Jack Williamson-style, 1930s sense of wonder, overlaid with twenty-first century attitudes towards character, civilization and cosmology. Short-story collections often are overwhelmed in the marketplace by their big novelistic siblings. But here are two superb assemblages that rival any doorstopper. Not satisfied with an admirably full docket split between editing and fiction writing, Ann and Jeff VanderMeer have become publishers as well, founding Cheeky Frawg Books, with a mission to promote off-kilter, uncommodified fantastical fiction. (This is not their first imprint, however. Their previous house was Ministry of Whimsy, established in 1984, so they know what they are doing.) Their first offering is Jagannath, a collection of short stories by a young Swedish writer, Karin Tidbeck. Smooth, lucid, alarming, Tidbeck’s compact stories are like a hybrid distillation of almost every writer in the VanderMeers’ massive anthology The Weird. A century’s worth of potent surrealism and estrangement surge through her veins and onto the page. A baker’s dozen tales constitute the slim volume, ensuring that each outing is a short, sharp derangement. In “Beatrice,” a sentient steam engine and living airship find human lovers. “Some Letters for Ove Lindstrom” reveals a human-elemental marriage ushering in a global sea change. A little plant man named Brown occupies the heart of “Miss Nyberg and I.” “Rebeka” blends the metaphysical SF of Ted Chiang with the contes cruels of Alfred Hitchcock, while “Herr Cederberg” offers a Bradburyish portrait of a man ill at ease with his body. “Arvid Pekon” recounts a strange bureaucracy where bad karma is dealt out, but tables get turned. A writer consorts with dreamtime ghosts in “Brita’s Holiday Village.” Echoes of Sylvia Townsend Warner’s fairy stories fill “Reindeer Mountain.” “Cloudberry Jam” discovers a vegetable changeling, while “Pyret,” in the manner of Avram Davidson, is a mock-scholarly disquisition on a supernatural creature. Both “Augusta Prima” and “Aunts” revolve around the inhabitants of surreal pocket universes in which time flows differently. And finally, the title piece is pure post-apocalyptic bio-SF that might have come from the pen of Philip José Farmer. Tidbeck’s tactics often feature admirable understatement, deft clue dropping, and misdirection, and a droll acceptance and insistence that life is stranger than we choose to generally imagine. Her inventive elegance produces miniatures that appear fragile, but are as perdurable as diamonds. 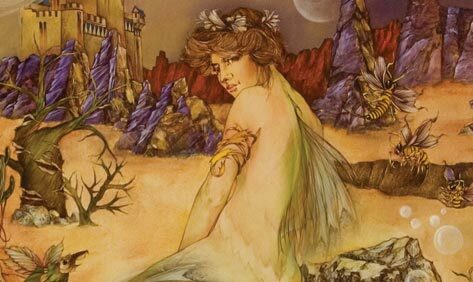 The year 2013 marks the fortieth anniversary of the publication of Patricia McKillip’s first novel. And while she has turned out a large number of award-winning books since then, an incredible and ever-burgeoning moonfleet of assured and distinctive fantasies, she’s had only one prior short-story collection, Harrowing the Dragon, from 2005. So the arrival of another such volume, relatively soon after its predecessor, is an occasion to be marked with many celebrations. The lively and enchanting stories in Wonders of the Invisible World certainly deserve all the accolades I can summon. McKillip’s creations can be grouped into several different modes, each of which presents unique pleasures. First come stories set in recognizable, consensus-reality milieus, where the fantastical is something of an intrusion or manifestation of grace. The opening, titular story, a rare dystopian science fiction outing, falls glancingly into that bucket, although the technological apparatus is anomalous in her oeuvre. Next up is “The Kelpie,” which concerns a group of Victorian or Edwardian bohemians whose obsessions with the stranger fringes of art lead to a dire encounter for one woman. A brother and sister encounter woodland guardians while visiting an uncle in “Hunter’s Moon.” A runaway teen finds her dreamed-of magical home in “Oak Hill.” Art features again in “Jack O’Lantern,” where an impending marriage is to be commemorated by a painting whose uncanny subject becomes all too real. Finally, “Naming Day” is a Harry Potter pastiche, while “Xmas Cruise” finds eerie doings aboard a “Rediscover Gaia” tourist expedition. This spectrum of narratives allows McKillip a real chance to stretch. She can evoke the eldritch melancholy of Yeats and Dunsany (“Out of the Woods”); the humor of E. Nesbit (“Knight of the Well”); or the layered magic realism of John Crowley (“The Kelpie”). Her prose is always restrained and subtle, allowing evocative metaphors to flash intermittently, like patches of sunlight in the forest. McKillip employs restraint and delicacy rather than melodrama, imparting greater resonance and power to these concise yet deep fantasies than is contained in any average trilogy. Editors and translators both, Yolanda Molina-Gavilán and Andrea Bell (Cosmos Latinos: An Anthology of Science Fiction from Latin America and Spain) have done the whole genre of SF an immense boon by getting into print a long-lost Spanish time-travel tale, The Time Ship: A Chrononautical Journey. But they do not release it naked, instead swaddling it with much informed research and exegesis. What the reader learns is that Enrique Gaspar was a fascinating, cosmopolitan, and urbane figure, highly significant in Spanish literature although mostly forgotten and unknown today, who essayed this Jules Verne-like tale in 1887 for a number of reasons. First, to keep his own fiscal head above water. Second, to satirize follies great and small. And third, to uphold the honor of Spain in all technologically progressive matters. The shapely narrative resulting from these conflated motives is nonetheless organic, authentic, and enjoyable. Gaspar created the story first as a very specific sort of play, a “zarzuela,” or kind of comic operetta, and the structure and character suite of the adapted novel retain that early template. Don Sindulfo, a pompous inventor, is paired with his assistant, young Benjamín, while Clara, Sindulfo’s niece — after whom he lusts — has her servant Juanita as chum. Two soldiers, noble Luis and lowborn Pendencia, round out the troupe. They would have all alternated songs onstage, but here the multivalent pairings and regroupings make for a lively banter. The first chapter sets the scenario: Don Sindulfo launching his temporal expedition from Paris, to much public acclaim. In the next two chapters he lectures on theory, while Chapter 4 gives the back-story of the characters and the creation of the ship. With Chapter 5 we’re off and running, as some amorous soldiers sneak onboard the ship and Don Sindulfo contracts with the French authorities to carry back some superannuated prostitutes in order to reinvigorate them. For, you, see, unless one is properly and scientifically insulated, backward time-travel regresses one physically, like Benjamin Button. Before you can say “Terry Gilliam’s Time Bandits,” our chronic argonauts are back in imperial China, searching for the secret of immortality, and hubristically hoping to stun the ancients with nineteenth-century knowledge. But their plans go kerflooey, and much farcical action ensues, resulting in a series of further voyages (Pompeii on the eve of destruction, Noachian times, etc) and hairbreadth escapes, until ending at the dawn of cosmological time itself. Gapsar’s work exhibits much humor and genuine speculation — although the latter has been since undermined. He finds human nature eternally perverse, and harkens to Voltaire’s wry philosophy. Additionally, we get curious foreshadowings of the twenty-first-century phenomenon of “atemporality,” where the past becomes a grab bag of disassociated tchotchkes freed from the original context. A charming and pertinent ancestor of modern SF, this worthy novel, overlooked for a century, will no longer be forced to hide its light of other days under a bushel.